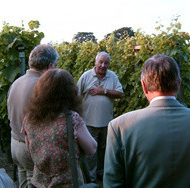 The visit took place on a very pleasant late Summer evening and the proprietor (Mr. Neil Gillis) gave, as an introduction to the tour and wine tasting, a very interesting history of the site and the reasons for growing wine in a location which is, on the face of it, far from the perceived climate of conventional wine growing areas in mainland Europe. The Romans originally set up a military camp at Viriconium (on the ruins of which the village of Wroxeter was later built) for two reasons, the first its defensive position, being surrounded by hills, and the second the micro-climate of that area of Shropshire due to being on the leeward side of the Welsh Mountains which produces good crop growing conditions of upwards of 1000 hours per annum of sunshine at a temperature above 10°C, the threshold for crop growth. These conditions were ideal to grow crops to feed the Roman Army and are normally only exceeded in the climate of the Southern half of France unless in the lee of mountain ranges. The city grew as a supply and trading post as the Army moved north to Chester and eventually is thought to have been decimated by the Plague in the 4th Century. Probably carried by black rats, on boats bringing goods from distant countries. Archaeological finds on the site have shown artefacts from all around the (then) known World. The town is thought to have been abandoned and destroyed by the Saxons who believed evil spirits inhabited stone buildings. From the middle ages stone was robbed from the site to build houses, churches etc.. 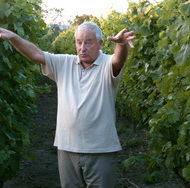 The Vineyard has about 13 miles of vines and several types of grapes are grown. The horticulture was explained; the vines are grown on a post and wire system with the grapes on the lower parts of the vines so that leaves above provide shelter from frost, weather and passing birds, whilst still allowing access to sunlight. 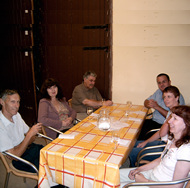 Different types of grape provide differences to aroma and taste in the wine produced. The vines are not generally affected by diseases other than occasional mildew, which is treatable. 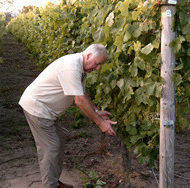 The vines are pruned by machine above the level of the posts and are pruned by hand on the sides. Elaborate measures are taken to protect the grapes from a hard frost by fires producing smoke above, by spraying the vines with water. Fans may be used to brig down warmer air from above and on some large European vineyards, helicopters are said to be hired to fly overhead to bring down warmer air to avoid expensive frost damage on the crop. 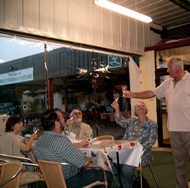 The wine tasting covered several wines and the methods of extracting the juice from the grapes were described. White wine is produced from the filtered juice of either red or white grapes, and red wine is produced by fermenting the skins of the red grapes with the juice in the early stages of the fermentation process and then filtering off the skins. 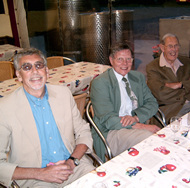 The Vineyard has won medals for its wines and the quality and consistency of taste etc. is maintained by the use of modern stainless steel juice separators and careful chemical analysis of the wine at the various stages of production. A brief description of faults in bottled wine was given such as precipitations of tannin and crystals of tartaric acid which are not harmful and can be separated without a problem. The serious problem of "corking" is usually caused by bacterial infection in the bottle due to inadequate hygiene. The name arises from infection thought to be due to a bad cork. 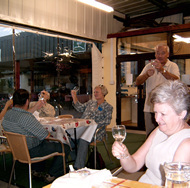 The evening finished with an excellent buffet meal washed down with a choice of wine selected from those tasted.